There are only two more rounds left in the Regular Season in LPB. Here is the last round review presented by ESL. The game between second ranked Correcaminos (9-4) and fourth ranked Panteras (7-6) was the most important one in the last round on Thursday night. Correcaminos were defeated by Panteras in a tough game in Panama City 65-71. It ended at the same time the two-game winning streak of Correcaminos. 25 personal fouls committed by Correcaminos helped opponents get some easy free throw opportunities. Worth to mention a great performance of Dominican power forward Brayan Martinez (203-91) who helped to win the game recording a double-double by scoring 15 points and 17 rebounds. Puerto Rican forward Benito Santiago (198-89, college: Cumberlands) contributed with 17 points, 6 rebounds and 4 assists for the winners. The former international point guard Trevor Gaskins (188-89, college: Louisiana Tech, agency: Pro Sports) answered with 17 points and 6 assists for Correcaminos. Panteras moved-up to third place, which they share with Caballos. Defending champion Correcaminos keep the second position with four games lost. Panteras' supporters look forward to an exciting derby game next round, where their team will travel locally in Panama City to the arena Halcones. LPB top team - Halcones (10-3) had no problems winning another game. This time they crushed sixth ranked Toros (1-12) in David 102-73. American center Christophe Massie (206-77, college: Memphis) stepped up with a double-double by scoring 17 points and 13 rebounds for the winners and Bradley Tumer chipped in 18 points and 6 assists. At the losing side Gil Atencio (202-96, college: St.Clair) responded with 24 points and 6 rebounds (made all of his ten free throws !!!). The winner was already known earlier in the game, so both coaches allowed to play the bench players saving starting five for next games. Halcones maintains first place with 10-3 record. Toros lost third consecutive game. They stay at the bottom position with 12 games lost. Halcones' supporters look forward to an exciting derby game next round, where their team will face at home their local rival from Panama City Panteras. In the last game of round 13 Atletico Nacional were beaten by Caballos on the road 85-80. LPB top team - Halcones (10-3) had no problems winning another game. This time they crushed sixth ranked Toros (1-12) in David 102-73. Halcones players were unselfish on offense dishing 22 assists. American center Christophe Massie (206-77, college: Memphis) stepped up with a double-double by scoring 17 points and 13 rebounds for the winners and naturalized American point guard Bradley Tumer (183-89, college: Clayton St.) chipped in 18 points and 6 assists. Five Halcones players scored in double figures. At the losing side Gil Atencio (202-96, college: St.Clair) responded with 24 points and 6 rebounds (made all of his ten free throws !!!) and point guard Joel Munoz (183-80) scored 5 points, 7 rebounds and 4 assists. The winner was already known earlier in the game, so both coaches allowed to play the bench players saving starting five for next games. Halcones maintains first place with 10-3 record. Toros lost third consecutive game. They stay at the bottom position with 12 games lost. Halcones' supporters look forward to an exciting derby game next round, where their team will face at home their local rival from Panama City Panteras. No shocking result in a game when third ranked Caballos (7-6) beat 5th ranked Aguilas (5-8) in Aguadulce 85-80. Caballos players were unselfish on offense dishing 22 assists. American-Puerto Rican forward Angel Matias (193-92, college: Georgia South) stepped up and scored 18 points, 9 rebounds and 4 assists for the winners and naturalized Puerto Rican Nate Butler-Lind (198-89, college: TCU) chipped in 21 points and 4 assists. At the losing side American guard Todd Hughes (190-95, college: Virginia Union) responded with 25 points, 5 rebounds and 6 assists and Jonathan King (193-90, college: Abil.Christian) scored 15 points, 6 rebounds and 8 assists. Four Caballos and five Aguilas players scored in double figures. Caballos maintains third place with 7-6 record having just three points less than leader Universitarios, which they share with Panteras. Aguilas at the other side keep the fifth position with eight games lost. Caballos will play against bottom-ranked Toros (#6) in David in the next round. Aguilas will play at home against the league's second-placed Correcaminos and hope to get back on the winning track. The game between second ranked Correcaminos (9-4) and fourth ranked Panteras (7-6) was the most important one in the last round on Thursday night. Correcaminos were defeated by Panteras in a tough game in Panama City 65-71. It ended at the same time the two-game winning streak of Correcaminos. 25 personal fouls committed by Correcaminos helped opponents get some easy free throw opportunities. Worth to mention a great performance of Dominican power forward Brayan Martinez (203-91) who helped to win the game recording a double-double by scoring 15 points and 17 rebounds. Puerto Rican forward Benito Santiago (198-89, college: Cumberlands) contributed with 17 points, 6 rebounds and 4 assists for the winners. Four Panteras players scored in double figures. The former international point guard Trevor Gaskins (188-89, college: Louisiana Tech, agency: Pro Sports) answered with 17 points and 6 assists and American forward Terrence Shannon (203-79, college: Elgin CC) added 12 points and 7 rebounds in the effort for Correcaminos. Panteras moved-up to third place, which they share with Caballos. Defending champion Correcaminos keep the second position with four games lost. Panteras' supporters look forward to an exciting derby game next round, where their team will travel locally in Panama City to the arena Halcones. We bring you last week's top performances from Panamanians who are playing abroad and who all have had prior experience of national team duties at youth or senior level. #1. This week's number one is an experienced international forward Michael Hicks (196-76, college: Texas A&M-CC, currently plays in Argentina). He led San Martin Corrientes to a victory over the closely-ranked Bahia Basket (11-18) crushing them 66-40 in the Argentinian La Liga in Saturday night's game. Hicks was MVP of the game. He recorded 16 points, 4 rebounds and 3 assists in 27 minutes on the court. San Martin Corrientes (14-16) is placed 12th in the La Liga. It's Hicks' first season with the team. Hicks has individually a very good year with high stats. He averages: 16.2ppg, 4.4rpg, 1.2apg, 2FGP: 51.9%, 3FGP: 33.3% and FT: 77.9% in 30 games he played so far. Ex-Toros del Chiriqui David player is currently a member of the Panamanian senior national team. #2. 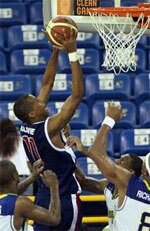 Second place goes to an international forward Akil Mitchell (206-92, college: Virginia, currently plays in France). Mitchell contributed to a Boulazac Basket's victory against the closely-ranked Gravelines-Dunkerque (18-10) 72-65 in the French Jeep ELITE ProA last Saturday. He scored 9 points, had 8 rebounds and dished 4 assists. Boulazac Basket Dordogne (15-11) is placed seventh in the Jeep ELITE ProA. Mitchell's overall stats this season are: 9.2ppg, 5.6rpg, 2.6apg, 1.2spg, 2FGP: 49.5% and FT: 37.5%. He is a naturalized American. Mitchell is in the roster of the Panamanian senior national team. Strangely he has never played in Panama. #3. The Panamanian player who performed third best last week abroad was an international guard Eugenio Luzcando (190-95, college: Idaho St., currently plays in Argentina) faced previously mentioned Michael Hicks in the Argentinian La Liga last game. Luzcando. He could not help Bahia Basket (11-18) to beat San Martin Corrientes (14-16). Luzcando recorded only 4 points and grabbed 6 rebounds in 20 minutes. Bahia Basket was crushed 66-40 on the road by the higher-ranked (#12) San Martin Corrientes. It was Bahia Basket's third consecutive loss in a row. This year Luzcando's overall stats are: 7.4ppg, 2.8rpg, 1.5apg, 1.4spg, 2FGP: 51.4%, 3FGP: 33.3% and FT: 66.0% in 25 games. He has a dual citizenship: Panamanian and Chilean. Luzcando is also a member of the Panamanian senior national team. #4. Power forward Jamaal Levy (206-83, college: Wake Forest, currently plays in Argentina) is a teammate of previously mentioned Eugenio Luzcando. But that was another game of his team in Argentinian La Liga which we would like to mention. Levy was not able to help Bahia Basket in their game against Regatas Corrientes (19-13). He recorded 5 points and grabbed 5 rebounds. Bahia Basket was badly defeated 74-56 in Corrientes by the much higher-ranked Regatas (#5). Levy's total stats this season are: 8.1ppg, 6.6rpg, 2.0apg and 1.2spg. He is also Panamanian national team player. #5. International center Javier Carter (203-91, college: S.Alabama, currently plays in Israel) was the main contributor in a 1-point Kiryat Motzkin's victory against the seventh-ranked Ironi Kiryat Ata (13-13) 76-75 in the Israeli National League (second division) in Tuesday night's game. Carter was the best player in that game. He scored 19 points, had 9 rebounds and made 2 blocks in 34 minutes. Maccabi Kiryat Motzkin (17-9) is placed third in the National League. Carter has very impressive stats this year: 19.6ppg, 8.9rpg, 1.7apg and 1.3bpg in 28 games. He is a naturalized American. Carter plays currently for the Panamanian national team. He used to play for Caballos de Cocle Aguadulce in Panamanian league. #1. Doron Lamb (193-G-91, college: Kentucky, currently plays in Greece) led Lavrio to a victory over the closely-ranked Holargos (11-13) 76-69 in the Greek A1 on Saturday night. Lamb was the best player in that game. He scored 18 points and added 3 passes in 30 minutes. GS Lavrio Aegean Cargo (7-17) is placed 11th in the A1. It was his team's first victory after three consecutive loses. There are only two games left until the end of the Regular Season. So now every game will be critical. Lamb has relatively good stats this year: 14.5ppg, 3.0rpg and 2.5apg in 24 games he played so far. He is a naturalized American. Apparently Lamb has never played in Panama. #2. Nate Butler Lind (198-SF-89, college: TCU, currently plays in Puerto Rico). He could not help Atleticos to beat Santeros (11-8). Butler Lind scored 8 points. 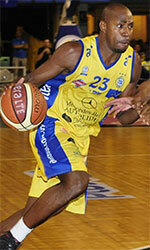 Atleticos was badly defeated 101-85 on the road by the second-ranked Santeros. Butler Lind's overall stats this season are: 4.0ppg, 2.3rpg and 1.5apg. He has a dual citizenship: Panamanian and Puerto Rican. Despite Butler Lind's Panamanian passport, he previously played for the Puerto Rican U19 national team and is probably not eligible to play for the Panamanian team. #3. Anell Alexis (200-F-90, college: Marist, currently plays in Germany) was not able to help BV Villingen-Schwenningen in their game against Muenster (16-6) in the German ProB (third division). Alexis cannot count Saturday's game as one of the best ones. He recorded only 2 points. The sixth-placed BV Villingen-Schwenningen (12-10) was defeated 75-62 on the opponent's court by the leading Muenster in the South group. It was BV Villingen-Schwenningen's fourth consecutive loss in a row. Alexis' total stats this season are: 5.9ppg and 3.3rpg. He is a naturalized American. Alexis used to play for Caballos de Cocle Aguadulce in Panamanian league. Notice: The list above includes only some of the Panamanian playing currently abroad. Go to Panamanian Abroad Page to see completed list.